You can always tell when it’s spring in St. Louis: blooming trees, Cardinals baseball, and tons of folks heading to Forest Park. One of the best options to avoid the traffic jams and parking issues is to take the Metro Forest Park Trolley. 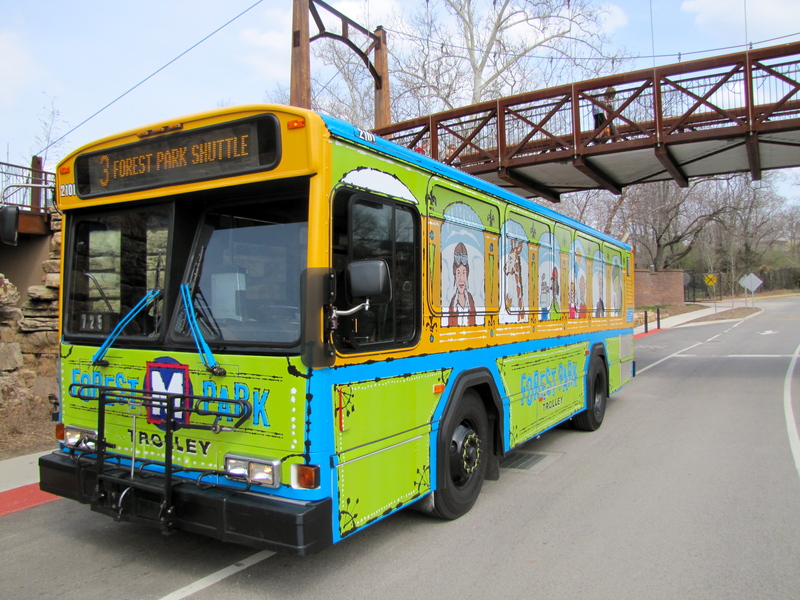 Metro Transit is pleased to partner again this season with Forest Park Forever and its Park partners, the Saint Louis Art Museum, Missouri History Museum, Saint Louis Science Center, and Saint Louis Zoo, to bring this valuable Trolley service to the region. The Metro Forest Park Trolley will operate daily from 9 a.m. to 5 p.m. from April 16 through October 31. The service will be extended during the peak summer tourist season until 7 p.m. each night from Memorial Day weekend to Labor Day. The Trolley will take visitors to all Forest Park attractions, as well as the Forest Park-DeBaliviere MetroLink Station. A one-day Trolley ticket for adults is $2 and children ages 5 to 12 ride for $1. Seniors 65 and older and disabled customers ride for $1 a day with a valid Metro Reduced Fare Permit. Children ages 4 and under ride free. Customers may purchase the trolley ticket aboard the Trolley bus and the ticket is valid for unlimited rides on a single day on this route only. That means park visitors can hop on and off the Trolley all day long with a valid ticket as they travel to the different attractions in the Park. All Metro tickets, passes and transfers will also be accepted on the route which is the #3 Forest Park Trolley. The Trolley will run every 20 minutes. The Muny Trolley returns this summer as well. Metro Transit is partnering again with The Muny Theatre to provide Trolley services to the Muny. The Muny Trolley will operate between the Forest Park-DeBaliviere MetroLink Station and The Muny Theatre at 20-minute intervals from 7 p.m. to 8:42 p.m. and again from 9:22 p.m. to 11:28 p.m. on all performance evenings. The Muny performance dates are June 18 – July 1, July 5 – July 11, and July 16 – August 12. While my disdain for the implementation of this service is well-documented on the blog here, this picture does make me chuckle. Metro calls this bus the ‘#3 Forest Park Trolley.’ Thankfully, the head sign in this picture is more accurate in describing what this thing really is. A wrapped bus, by any other name, is still a bus. And a parking lot shuttle, wrapped in kid-friendly wrapping or not, is still a parking lot shuttle. I still don’t like it, and I still wont ride it. But that is just me.